Berners-Lee who invented the World Wide Web is this year’s recipient of the A.M. Turing Award, computing’s version of the Nobel Prize. He is 61. The award, announced by the Association for Computing Machinery, marks another pinnacle for the British native, who has already been knighted by Queen Elizabeth II and named as one of the 100 most important people of the 20th Century by Time magazine. 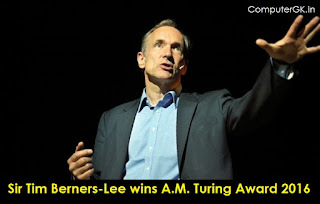 The Association for Computing Machinery (ACM), the organization that awards the $1 million prize, announced the Turing Award winner earlier this week. The computer science rockstar has picked up more than a dozen major prizes and honorific titles over the years; for instance, he's earned a place in the Internet Hall of Fame and has been knighted by Queen Elizabeth II. That invention not only transformed the world in unimaginable ways but was also a technically and conceptually challenging feat, ACM noted. Berners-Lee invented the unique system for locating data on the web (such as the now-ubiquitous URLs that help users navigate to a specific page).